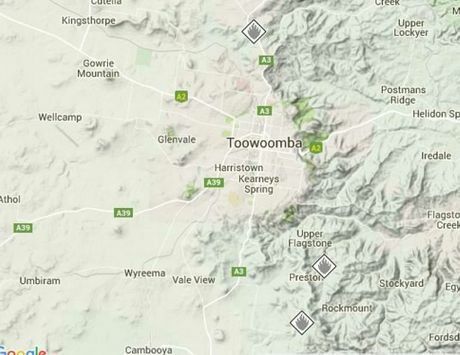 Fires threaten Toowoomba: Tim Chittenden QFES Command talks about fires that are threatening Toowoomba and Highfields. UPDATE: The bushfire Watch and Act message for Ballard, north of Toowoomba has been downgraded. The Queensland Fire and Emergency Services warning level is now Advice, which means although there is a fire, there is no immediate threat. The service is advising residents that a large bushfire is burning near Murphys Creek Rd, James Byrne Rd, Bradys Rd and Recreational Reserve Rd, Ballard (north of Toowoomba). Crews will remain on scene into the evening. There is no threat to homes at this time, although a large smoke haze is affecting nearby areas this afternoon and tonight. Seventeen fire crews and water bombing aircraft are working to contain the blaze, which broke out around 1.15pm today. • Checking and patrolling outside for embers, extinguishing any spot fires and seeking shelter as the fire front arrives. Residents are advised to call Triple Zero (000) if they believe their property comes under threat. Regular updated information will be provided on the Rural Fire Service Queensland (RFSQ) website at ruralfire.qld.gov.au or listen to local radio. For information on current bushfire incidents ruralfire.qld.gov.au/map.htm. Earlier the warning level had been Watch and Act which meant there was a heightened level of threat, with residents needing to be aware of their situation and take actions to be prepared and protect themselves and their families. EARLIER 5.10PM: FIREFIGHTERS are confident they are on top of fires that had been threatening houses in Highfields. 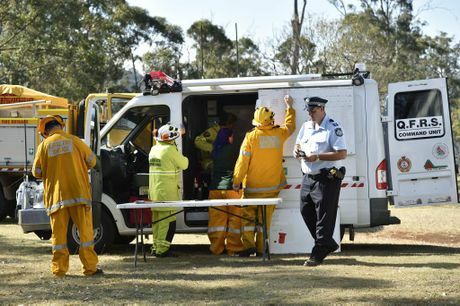 Queensland Fire and Emergency Services Command's Tim Chittenden urged all residents to review their bushfire survival plan after a fast-moving fire on the Toowoomba Range. 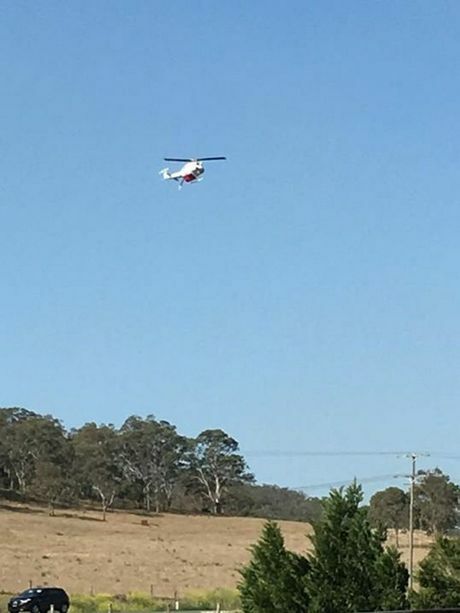 Fourteen fire crews and two water-bombing aircraft are fighting the blaze climbing the Toowoomba Range at the back of Highfields. Mr Chittenden said the fire started at the base of the range off Murphys Creek Rd at Ballard and the hot, dry conditions and strong winds had pushed it up the mountain. He said crews hoped to have the area secure in the next hour. "The fire moved quickly up the Range into Highfields Rd around Bradys Rd," he said. 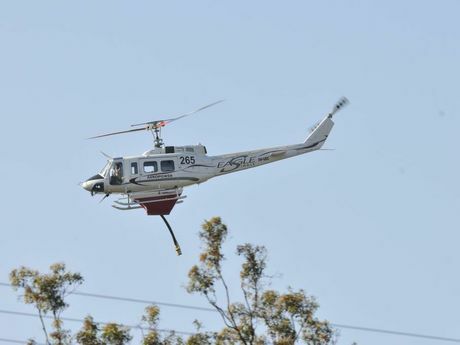 "We currently have 14 fire appliances and two water-bombing aircraft working to contain the fire and protect structures. "At this stage we are on top of this fire. "We hope to have it to a safe point in the next hour." Mr Chittenden said fire crews had been monitoring the dry conditions and had been ready to respond to any emergent situation. "We're in a hot dry period at the moment and we've got some strong winds today, tomorrow and Thursday," he said. "We're asking people to be very careful (and) make sure they are following all conditions on their permits." EARLIER 3.48PM: Queensland Fire and Emergency Services is advising residents in the vicinity of Ballard (north of Toowoomba) to enact their bushfire survival plan. At 3.30pm today a large bushfire was located at Ballard. The fast moving fire is travelling in a westerly direction and is expected to impact the areas of Murphys Creek Rd, James Byrne Rd, Bradys Rd and Recreation Reserve Rd around 4.30pm. This fire is moving quickly and firefighters are experiencing difficulty in controlling it. Spot fires may occur ahead of the fire front and embers are also being thrown from the fire. The fire is expected to impact on the Ballard community and there is a chance that some property may be lost. Power, water and mobile phone supplies may be lost in the area over the next several hours. It will be very hot and windy and as the fire approaches it may become increasingly difficult to see, hear or breathe. Residents are strongly advised to leave now if their plan is to do so or if they don't have a plan. Leaving is the safest option for survival. Well prepared and defended homes can offer safety during the fire and may be defendable. Currently, ten fire crews and water bombing aircraft are working to contain the blaze but firefighters will not be able to protect every affected property and residents should not expect a firefighter at their door. Residents are advised to call Triple Zero (000) if their property comes under threat. Regular updated information will be provided on the Rural Fire Service Queensland website at www.ruralfire.qld.gov.au or listen to local radio. For information on current bushfire incidents visit http://www.ruralfire.qld.gov.au/map.html. Advice: Monitor conditions and review your bushfire survival plan. Watch and Act: Conditions are changing. Start taking action and follow your bushfire survival plan. Emergency Warning: You are in danger. 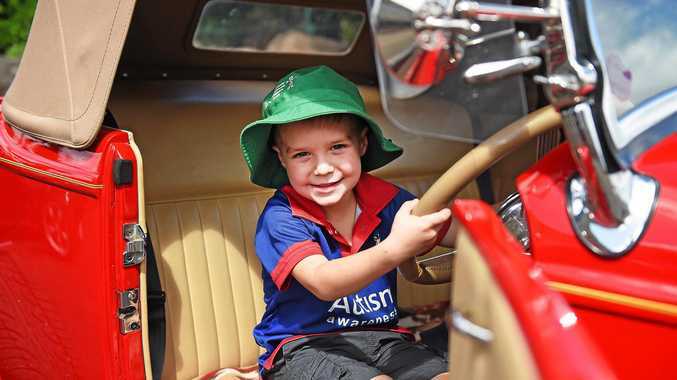 Act on your bushfire survival plan now. 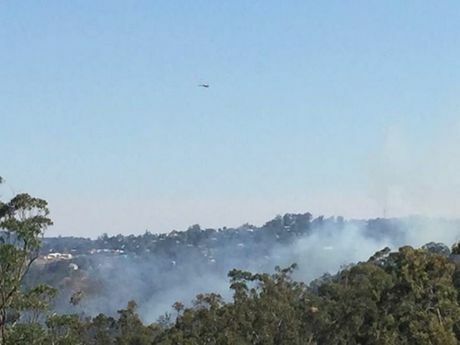 EARLIER: Queensland Fire and Emergency have issued a fire alert to residents on the Toowoomba range escarpment near Highfields and Blue Mountain Heights. Affected areas include Vayro Rd, James Byrne Rd, Brayds Rd and Recreation Reserve Rd at Highfields. Multiple fire crews are responding to the grass fire which ignited about 2pm. The fire is increasing in size. Residents are urged to be aware of the situation and take action to be prepared and protect themselves and their property. News Fraser Island management blamed for the recent dingo attack.